[Paris] Everywhere we look, one cannot escape the reality that our urban spaces are overcrowded and polluted, with scarce natural resources dwindling rapidly. Currently about half the world's population lives in cities and that is projected to increase to 75%, by 2050. The time is ripe to start designing smarter urban environments in new cities and retrofit older ones to sustain an ever-growing population. So what kind of city will they be living in? 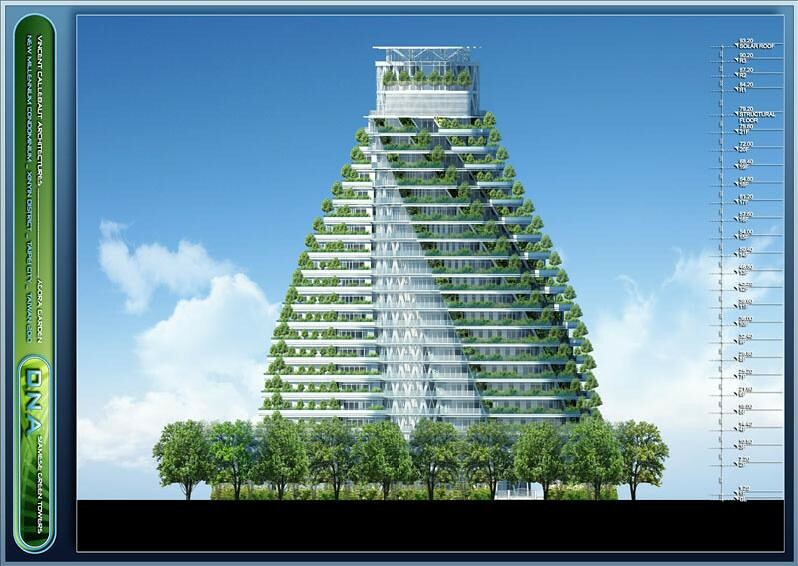 Belgian architect Vincent Callebaut’s vision to design a high rise "urban farm" provides a viable solution to a healthier future for the estimated six billion people who will live in cities by 2050. "The city of tomorrow will be dense, green and connected. The goal is to bring agriculture and nature back into the urban core so that by 2050... we have green, sustainable cities where humans live in balance with their environment. Each building must ultimately be a "self-sufficient, mini-power station," said Callebaut. You take the lift to your office, passing the rice paddy and one of the many gardens housed in the glass edifice that not only heats and cools itself, but also captures rainwater and recirculates domestic waste as plant food. With that, Mr Callebaut introduced his project the ‘Dragonfly’ - a design for a massive, twin-towered, ‘vertical farm’ on New York’s Roosevelt Island. From each tower springs a large, glass-and-steel wing, so that the edifice resembles the insect after which it was named. The structure includes areas for meat, dairy and egg production, orchards, meadows and rice fields along with offices and flats, gardens and public recreation spaces. Energy is harvested from the sun and wind, and hot air is trapped between the building ‘wings’ to provide heating in winter. In summer, cooling is achieved through natural ventilation and transpiration from the abundant plant growth. Plants grow on the exterior shell to filter rain water, which is captured and mixed with liquid waste from the towers, treated organically and used as fertiliser. And at the base of the colossus is a floating market on the East River for the inhabitants to sell their organic produce. They made fun of me. They said I created a piece of science fiction,’ Mr Callebaut says of his detractors. With awareness growing to the plight of our over populated planet and climate change, his ideas have gained traction, and the Dragonfly design has been exhibited at an international fair in China. Mr Callebaut has also drafted a concept for a floating city resembling a lily pad that will house refugees forced from their homes by climate change. And he hopes to sell a design for a ‘farmscraper’ in Shenzhen, China that will include housing, offices, leisure space and food gardens. As yet, Mr Callebaut has found no buyers for these big projects. ‘With the recent economic recession, politicians and government may... have been reluctant to venture into such new, large-scale endeavours that have not been tested before,’ Emilia Plotka, a sustainability expert at the Royal Institute of Royal Architects, told AFP of Dragonfly and similar projects. But she pointed out the concept has inspired other, smaller projects.